The Flixton, in Urmston (named for its location on Flixton Road); brings an unpretentious a la carte twist to home comforts. A perfect approach in cementing themselves as a vital component within the up and coming restaurant scene, in Urmston. When you walk in through the glass fronted doors to the restaurant, you immediately get a sense of understated glamour. The Flixton is warm but not overly lit; it feels like home, but on a special occasion. The seating arrangement is spacious, yet intimate; ideal for a restaurant of this size. Relaxing modern music, fills the room nicely, at a volume that allows conversation to flow. The welcoming staff guide you to your seat, in which you’ll start to notice all the little touches of glamour within the Flixton restaurant. Brightly coloured napkins stand out nicely against the fairly neutral surroundings. 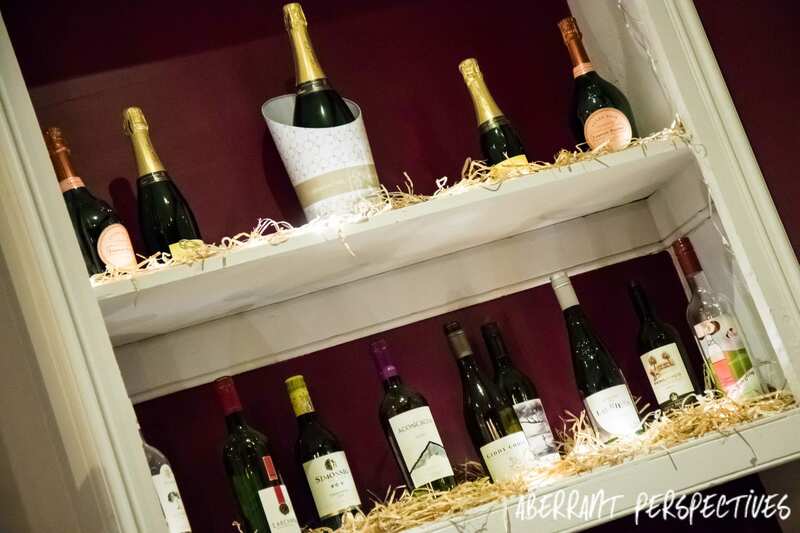 Champagne and wines are creatively displayed on a bookcase, however they don’t dictate your focus. Much like everything in the Flixton, it is certainly ‘a la carte’; but it is far from pretentious. In fact it is warm, welcoming and it is clear that good food and a great experience is at the heart of this family run business. They have an extensive ‘express lunch’ menu, available as two courses starting at £11.75 per person. It features a reduced menu, full of ‘restaurant favourites’. The starters set the tone for the culinary treats on offer throughout the whole menu. They have a wild mushroom risotto, spicy tuna fishcakes, crispy whiting and a black pudding cake. For the main courses, the ‘express lunch’ menu offers a variety of favourites from their main menu. The Flixton fish and chips; beer battered fish with ‘chunky chips’ and crushed peas. Caesar Salad, with garlic croutons, Parma ham and an interesting choice of Anchovy dressing, although they have alternatives if you’d prefer. Steaks and pie of the day are available too. But the ‘stand out’ dish has to be their Wagyu & Bone marrow Burger; served in a brioche bun, with tomato relish, mayonnaise, salad and skinny fries. If you’re feeling extra hungry, their side dishes add an interesting addition to the main courses. For example their sweet potato and chive mash and chilli buttered tender stem broccoli will give your meal that satisfying edge. The a la carte menu features a range of home comforts, with extra special twists, and displayed in a way that’s worthy of the Hepworth prize. Starters feature; Poached king prawns, goats cheese and beetroot bon bons, steak tartare, honey roast gammon and a tomato and garlic press, providing a mouthwatering choice of appetiser. 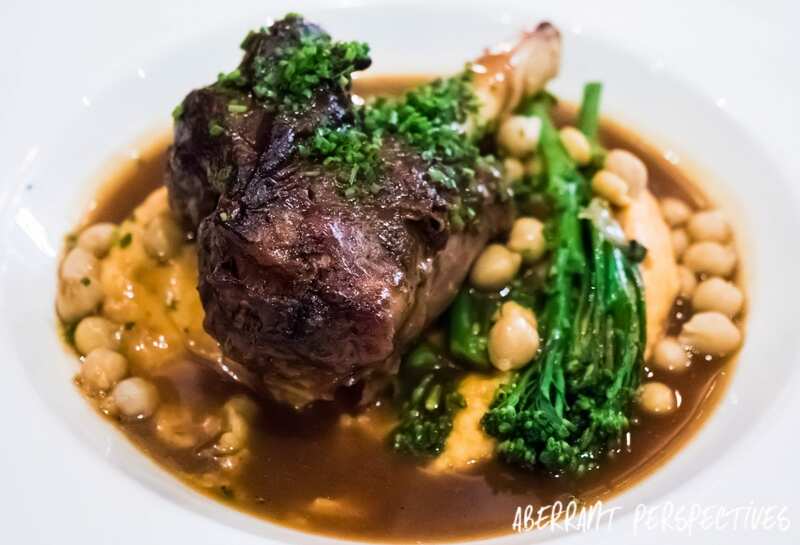 Main courses come with a range of favourites expected in a restaurant, but they all feature a twist in ‘flavour fusions’, that you will steal for your future dinner parties, at home. The slow braised beef short rib features baby onions, glazed carrots, bacon lardons, confit mushrooms and a red wine and thyme jus. 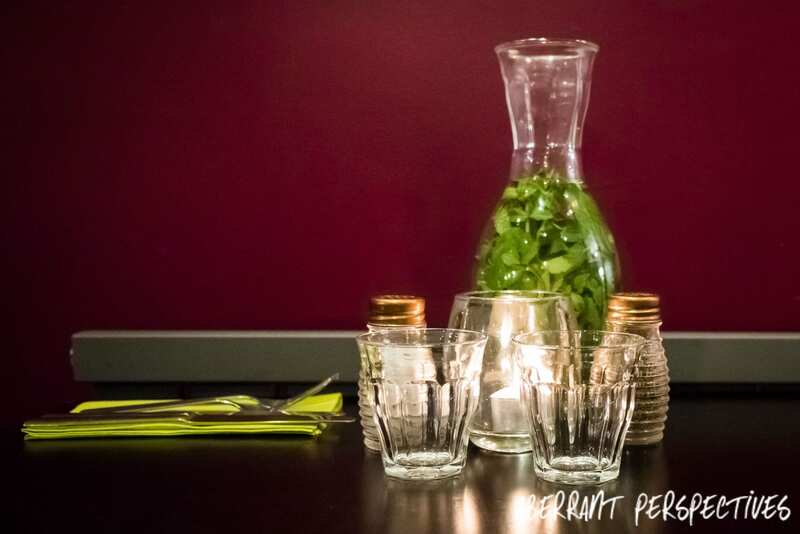 Rump, fillet and sirloin steak all come with chunky chips beer braised onions and a sauce or butter of your choice; peppercorn, diane, Chimichurri sauce, chilli butter or sun-dried tomato and horseradish butter. The bacon wrapped prop fillet (served pink) comes with caramelised apples, orange glazed carrots, black pudding bon bons, pommel puree and roasting juices. Pie of the day, although arguably ‘cliche’ for a restaurant, is unlike any other pie you have had before. 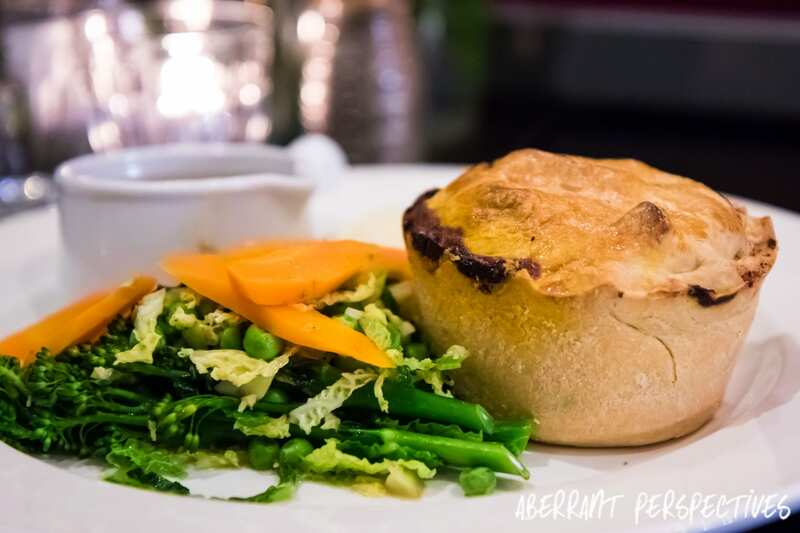 It is filled to the brim with perfectly portioned contents, served with freshly cooked seasonal vegetables, mash potato with a side of gravy. 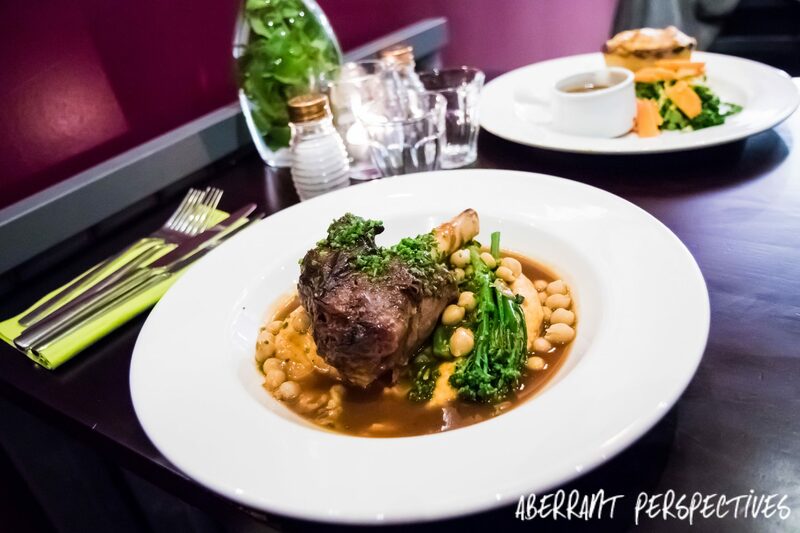 The slow cooked lamb shank, (my choice for the evening), comes on a bed of delicious sweet potato mash, with chickpeas, tender stem broccoli and tomato jus. Mine came perfectly cooked and ‘fell’ off the bone. In keeping with the theme of putting a twist on traditional favourites, they have done this to vegetarian options too. They have bubble and squeak risotto, which comes with crispy egg; and roast vegetable polenta, with a red pepper purée, curried chickpeas, broccoli and soy dressing. For those who love seafood, the Flixton restaurant won’t disappoint. Their pan fried sea bass comes with tomato and chorizo risotto and crispy spinach. An interesting option of tandoori halibut comes with bombay potatoes, crispy spinach, samphire and cucumber raita. Additionally they have another tradition favourite, the Flixton’s fish pie. Made with their home made fish pie sauce, king prawns, smoked salmon, halibut, buttered samphire, peas and crusty bread. If (unlike me) you find you have room for desert, (lucky you!) then the deserts will end your meal perfectly. Their mouthwatering choices feature a twice baked chocolate soufflé with a chocolate and whiskey sauce. The liquorice panna cotta comes with poached rhubarb, parkin crumb, blackcurrant sorbet. Apple and calvados brulée comes with almond biscuits. What is a typically bland desert, the vanilla cheesecake, is complimented with a raspberry purée, caramel tuile and raspberry ripple ice-cream. Also their black forrest gateau comes with a cherry sorbet and poached cherries. There are several offer available at the Flixton Restaurant throughout the week, featuring a range of two or three course deals. These are updated and easy to find on their website: The Flixton Restaurant. You can also book a table through their website. Additionally all their latest information is on social media, you can find them on Facebook, Twitter and Instagram. 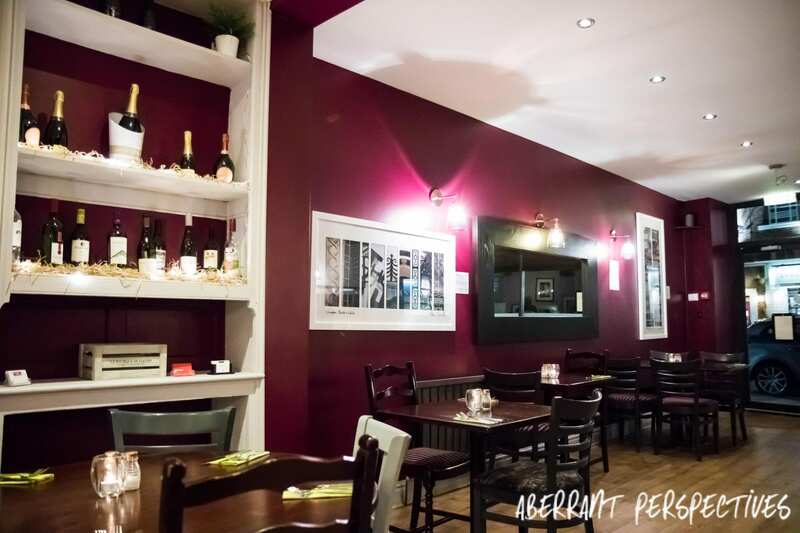 If you would like for us to pop down to review your restaurant, Contact Us Here.